If you're looking for an ultra-compact camera that can deliver great-looking photos and video in almost any situation, and you're willing to pay a big premium for that, this is the model you should consider first. The affordable point-and-shoot compact camera has become all but obsolete, a casualty of the fact that almost everyone has a great smartphone camera in their pocket these days. Instead, manufacturers have begun focusing on producing specialist compacts that deliver something above what you'd find in a phone snapper. In the case of the Sony RX100 VI – and for for the first time in the product's series – the lens extends to a 200mm equivalent, to combate the smartphone lure. This tiny camera – the sixth iteration of Sony's high-end compact in six years – sports a large 1-inch sensor, plus the ability to shoot 4K video with HDR, ultra high-speed bursts or high frame rate videos for silky slow motion playback. All that comes at a premium: this is one of the most expensive compact cameras on the market. The question is: has Sony delivered a killer product worth the asking price, or a wallet-draining white elephant? Some premium compacts stretch the definition of the word 'compact' quite far, but not the RX100 VI. This truly is a compact camera, with only the bulge from its lens preventing it from fitting in a normal trouser pocket. As it is, you'll probably have no trouble carrying it in a coat or jacket pocket, and obviously it'll take up very little room in a bag. It might be small, but it's sturdy. The body is metal, adding to the premium feel – although Sony makes no claims regarding weatherproofing, so we'd suggest keeping it out of the rain. The body is mostly smooth, but a rubber-textured thumb grip and the lens ring give your hands a couple of places to latch onto. While the 3-inch screen doesn't flip out, it tilts down around 90 degrees or up almost 180, making it handy for composing selfies or shots when you're holding it high above your head or low to the ground. It's a touchscreen too, supporting always-useful touch focus: to pick your focus point, you can simply tap the screen in the desired place. The screen is sharp and bright with strong contrast, but in bright, direct sunlight you might struggle to make out the finer details. In situations like this, the RX100 VI's electronic viewfinder shows its value. Despite being absolutely tiny, this pop-up OLED EVF supplies you with a surprisingly large, natural-looking and finely detailed live view that's fantastic for composition and review of your shots. All in all, Sony has done a fine job on this camera's design, but it's worth mentioning that the rear and top buttons are all tiny. We believe most people won't have an issue with that (we certainly didn't), but those with larger hands may find the power, movie stop/start, Fn (function) and menu buttons a touch fiddly. Those are the perils of downsizing. Sony has built the RX100 VI for speed. There's a hybrid autofocus system on board with 315 phase-detection points covering almost the entire frame, plus 25 contrast-detection points. That's a lot of coverage, and it means the camera can lock onto (and stay locked onto) even tricky moving subjects. It does so really quickly too, which makes using the camera a joy – in our time with it, we never had any major issues getting a swift lock on anything. This focus system appeared in the previous M5 model, which is when the RX100 series became extra serious about focus (and when its price point jumped up a notch too). That focus on speed (no pun intended) extends to continuous shooting, which goes all the way up to 24fps with autofocus tracking (for up to 233 shots). If you're desperate to capture that car speeding past or that dog gambolling around the park, this means you can rattle off a long volley and pick the best shot after. With a 1-inch 20.1MP sensor and 24-200mm f/2.8-f/4.5 Zeiss zoom lens, the RX100 VI has a good-looking optical setup on paper. In practice, the camera's effective image stabilisation and noise reduction tech makes it even better than it sounds – although you do have to be slightly careful in low-light conditions. A 1-inch sensor is large scale for a compact, but smaller than the APS-C or full-frame sensors used by DSLR and compact system cameras (CSC). While the lens has a bright aperture, maximise the zoom and it stops down, meaning less light-gathering capabilities with snappy shutter speeds. The RX100 VI therefore slows down the shutter when there's less light available, especially at longer zoom, which means anything moving tends to blur. So, even with that impressive image stabilisation, noise reduction and the high maximum sensitivity of ISO 25,600, taking shots indoors or at night requires some care. In good lighting, the camera's excellent optical quality comes to the fore, with virtually no image noise visible in your JPEG files, even when you zoom right into them; the level of detail here is superb for a compact camera. The noise reduction kicks in at higher ISO settings, and can give pictures a somewhat mushy, undefined quality at extreme zoom, but it's barely noticeable when viewing photos at normal size. And compared to the competition, Sony is on point by comparison. The small sensor makes achieving bokeh a bit trickier than with a system camera, but in certain situations it's possible to give your shots a smooth out-of-focus background – something most compact point-and-shoots really struggle with for anything other than macro shots. While we weren't able to test the high dynamic range (HDR) recording, 4K video clips are sharp, clean and impressive – at least in adequate, even lighting. When there's less light available, grain creeps into footage and begins to degrade detail, so you may as well use 1080p in these cases. While Sony makes some claims towards pro-quality tools like the S-Log profile for the RX100 VI, the sensor appears slightly too small to produce the sort of mind-blowing 4K videos you'd get from system cameras like the Panasonic GH5S or Sony's own A7 III. What is a lot of fun is the HFR (high frame rate) recording, which allows you to record short clips at frame rates of up to 1000fps, then play them back at normal frame rates for buttery smooth slow motion. Used correctly, this can result in some stunning footage. Just avoid low-light conditions. 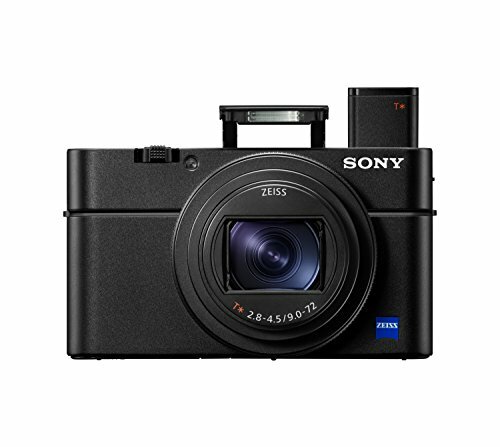 There's no other camera this tiny that offers the sheer quality and versatility of the Sony RX100 VI. Yes, it's very expensive, but this has been designed to be the very best small compact on the market, and taking into account its image quality, its excellent autofocus system, its zoom range, its viewfinder and the options it offers more creative photographers, we believe it achieves that goal. In all honesty, we can't muster up any major criticisms other than the inevitable aperture dip at those longer focal lengths. Oh, and if we're nitpicking then the buttons could be a little bigger and easier to find when you're looking through the viewfinder. While it can't match the Sony's svelte form factor or 4K video skills, Canon's premium compact sports a larger APS-C sensor that can match DSLRs for image quality. Plus it's dust- and splash-proof.